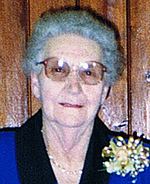 Anna Louisa Borgas was born on 2nd December 1912, as the tenth child of Carl and Emilie Borgas nee Wurst, at their Appila home, with Auntie Marie Borgas as mid-wife. On 15 December Anna was baptised by Pastor A. MacKenzie. Anna commenced schooling at the Appila Public School mid year 1919. With her sisters Emilie and Vera, Anna mostly walked the three miles to and from school. On gaining her year seven Qualifying Certificate Anna wasn’t of age to leave school and remained the following year as a ‘Monitor’ assisting the teacher. For the first half of the year these duties were on an unpaid basis, however for the remainder of the year she received thirteen shillings and six pence a fortnight. ($1.35). This was considered good pay for one at thirteen years of age. Anna was confirmed by Pastor S. Rudolph on 11 December, 1927 in the Fullerville Church. Anna remained at home to help with the house duties and milking the cows. In 1933 Anna spent six weeks in Tanunda at a dressmaking course. Following Carl’s marriage in June 1942, Anna, together with her parents and invalid brothers Norman and Walter moved to a house in Yandiah. On Saturday, 8 August 1942, after a courtship of some twelve years, Anna and Eric Oswald Becker of Laura were married in the Gloria Dei Church by Pastor J.B. Traeger. The couple settled on a property 4 miles west of Caltowie. Grain crops and sheep provided their main income, with cows, pigs and poultry supplementing the income. Over the years Anna reared and raised many hundreds of turkeys. During the first year Anna would drive the horse and sulky to Caltowie to deliver cream and eggs to the railway station; from there they were dispatched to the factory. After a good first harvest they were able to buy a small Ford utility and Eric taught Anna to drive as she had never learnt. Anna’s father didn’t believe in women driving cars! Anna and Eric successfully continued their farming; extending their acreage with the purchase of adjoining property in 1956, the land they had share-farmed for many years. Eric was a handy man and built a number of sheds and various other improvements to the farm and machinery. Anna tended the garden and grew many of their vegetables. Both Anna and Eric were regular and active members of the small Redeemer Lutheran congregation at Caltowie until its closure in October 1981, after which they joined St. John’s Jamestown. While their children attended the Caltowie Primary School they served on School committees in various capacities. In February 1981, prior to Colin’s marriage, Anna and Eric retired to a home at 48 Alexandra Terrace, Jamestown. Anna continued her love of gardening while Eric pottered about in his work shed. During 1989 Eric’s health declined and subsequently it became evident that the home and large block were more than they could manage. In July 1991 they moved to a small unit at Belalie Crescent, Jamestown. Eric and Anna were able to celebrate their Golden Wedding with family, relatives and friends on 9 August 1992. Eric was called to his heavenly home on 7 September 1992. Anna continued to live in her unit after Eric’s death. She spent many hours tending her garden, cooking, playing cards with her neighbours and enjoying knitting and making jigsaw puzzles. Anna continued to drive her car around Jamestown for shopping, Probus and Senior Citizen’s. She continued to be actively involved in Church and Ladies Guild. Anna made many new friends and joined in the activities of the home. Some weeks there were not enough days to just sit and rest; there were always things to do. When she went into the Home she didn’t think she would take many jigsaw puzzles, there would be no where to do them. The collection had grown and she found time to do one in her room and with some of the other residents worked on another in the lounge room. No doubt Anna did the majority! A puzzle from Anna’s niece was started about 2 weeks ago and completed late last week. Our sincere thanks to the staff of Belalie Lodge who cared for Anna’s every need in a most caring and professional manner. She loved you all and spoke often of your care and concern. Also to the relatives and friends who called or phoned Anna; the time you spent with her was much appreciated. We give thanks to God for the life of Anna and what she has meant to each of us.